Why do we lowly humans experience aesthetic beauty? Life started evolving on our planet somewhere between 2.7 and 3.5 billion years ago. Something happened during that time that blessed us with the ineffable pleasures of music, visual art, poetry, and the wonders of nature. What could that something be? It’s the sort of question that Pat and I ask each other as we pursue our unending fascination with Story. The other day, Pat ran across a bit of news that seems to offer a tantalizing morsel of an answer to that question. Not along ago, underwater photographer Yoji Ookata spotted something amazing while diving near the Japanese island of Amami Ōshima. About 80 feet below sea level, a beautiful circular design was carved in the sandy seabed. The “magic circle” was about 6.5 feet across, exquisitely shaped from meticulously raised ridges, and decorated around the edges with tiny seashell fragments. What artist would have gone to the trouble of sculpting such a work there, where it was doomed to be washed away by ocean currents unseen by humans? As it turned out, the creator of such patterns is the 5-inch-long male puffer fish. The design is intended to attract a mate. If a female puffer fish finds the circle sufficiently attractive, she lays her eggs in its center. The male fertilizes the eggs and buries them; the circle’s ridges will offer protection from ocean currents, and the sea shell fragments will supply vital nutrients. A BBC video narrated by Richard Attenborough shows this process from beginning to end. The circle bears a stunning resemblance to the mandala, that ancient Hindu and Buddhist symbol of the universe. Countless human artists have been inspired by this sacred shape, including painter Linda Laino. Pat and I are especially struck by parallels to the modern Zen practice of making sand mandalas. 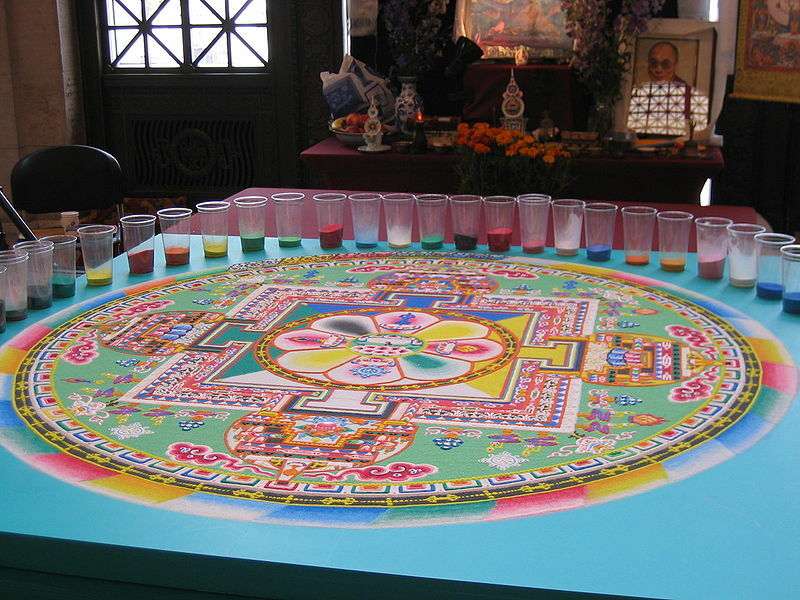 A video made at Clark College shows a group of Tibetan monks creating such a mandala. This large and dazzling image is built with meditative patience, just a few multi-colored grains of sand at a time. The Zen mandala is ritually destroyed after its completion, much as the puffer fish’s “magic circle” is destroyed by the sea. All beauty, after all, is transient. Looking at these newly discovered designs, it occurs to Pat and me that such subconscious connections predate the human species by eons. When we look into these undersea mandalas, we gaze deep into the evolutionary matrix of aesthetic beauty. The puffer fish’s circle brings us full circle. Our love of beauty is as one with our unceasing quest for life. This post is dedicated to William S. E. Coleman. 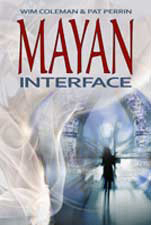 This entry was posted in Thinking about story … and tagged aesthetics, Buddhism, E. O. Wilson, Hinduism, Linda Laino, magic circle, mandala, puffer fish, The Diversity of Life.